Description: There is an interesting trend in jazz. Many American musicians, especially young ones, are increasingly releasing their recorded music as downloads only, and some Japanese minor labels are beginning to release them on CD for Japanese fans who are not satisfied with the compressed MP3 files. 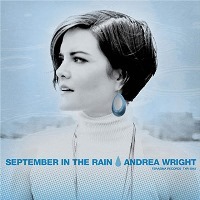 September In The Rain by Andrea Wright is one of these CDs that are only available in Japan. Wright hails from Michigan and studied piano. After graduating from Oberlin College she moved to New York and discovered her vocal talent after meeting bebop vocalist Marion Cowings. In this album, recorded in 2009, she is surrounded by first-call New York-based musicians: pianist Harry Whitaker (who sadly passeed away in 2010), bassist Noriko Ueda (DIVA Jazz Orchestra), drummer Quincy Davis (Wynton Marsalis, Russell Malone, Eric Reed), guitarist Saul Rubin (Sonny Rollins, Roy Hargrove), and guest trumpeter Warren Vache. With distinctly straight-ahead sensibilities and straight-forward delivery, Wright eschews technical displays and strikes an interesting balance between emotion and a certain degree of cool, detached feeling. The combination of her style and her attractive voice with a hint of darkness is quite attractive. Recorded in Septebmer 2009 at The Gallery, New York City. Remastered for CD release in Japan by Masayoshi Masubuchi. CD release produced by Yasukuni Terashima for Terashima Records. Released in 2014 in a gate-fold paper sleeve package.